Here’s a couple of the latest items to roll off the work bench… Mostly raging forward with the Falklands theme of the week. 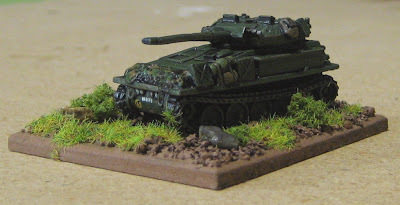 This is the Scimitar CVRT from MJ Figures Falklands line. It’s a very nice kit and comes with three barrel options so you can make either the Scorpion, Scimitar, or … something else…? Scorpion 90? These are the first samples of the from MJ Figures Argentines I’ve done. There's only one pack of each of the Argnetine infantry (Infantry, and Infantry in trenches). In the Infantry pack, out of ten guys there are two (count 'em, TWO!!?) guys with some bazooka type thing and one firing a pistol, not the most useful of poses... Ah well... what are you going to do? Thank goodness I'm doing stands and not using them for a 1:1 skirmish game and trying to put together squads and platoons of guys with appropriate weapons! It'd drive me crazy! These are from Peter Pig. 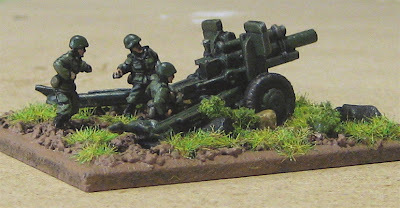 The gun is the 105mm Howitzer from their Vietnam line, the crew is from their AK-47 line (“Helmeted Crew” was the name of the pack, I think…). The Peter Pig stuff is very nice, but considerably smaller than the MJ stuff (and not exactly cheap!). I’ll be using these are Argentines. They should be well enough off to the side that no one will notice. I might pick up one of the MJ Figures Howitzer and crew packs if I decide I need more. Switching scales and conflicts… I think the figures here were from FAA..? The Jeep is from Rafm. 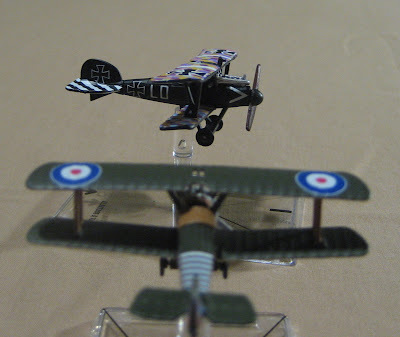 This will be the CO stand in Blitzkreig Commander (or other games…) for my NW Europe/Late War Canadians. The markings on the Jeep, if you can make them out) are for (I hope...) the HQ of the 5th Canadian Infantry Brigade (2nd Canadian Infantry Division). Tim’s Naval Yard – a step by step look at how I scratch built some wee ships for high seas action in the age of sail (and PIRACY!). 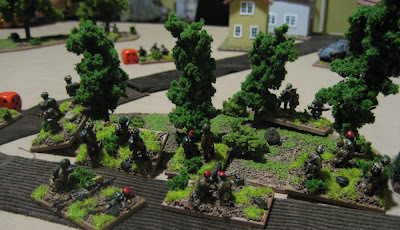 Another Blitzkrieg Commander game report – Gary and I played again last night. This time British and Germans in North Africa; a British infantry batllion defends a desert pass against a combined force of German infantry and Armour! Played a little Double-header this Friday evening with Mr. Curt Campbell. 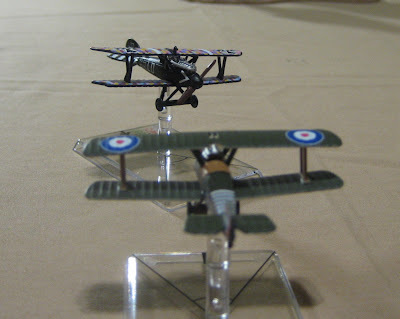 Got off to a bit of a slow start as Curt forgot his aircraft models for Wings of War – It was well worth the wait for him to run back and get them as their very nice little toys . We played a quick one-on-one game. 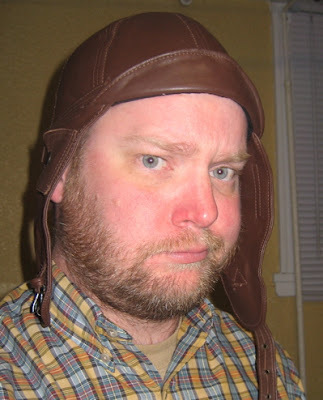 I had a Sopwith Camel and Curt (or should I say “Kurt”) took an Albatross of some sort. Same thing, close up on the planes. At our second pass I took 5 more damage and took some rudder damage and was unable to make any right hand maneuvers for the rest of the game…! Later I got two turns of firing into him from more or less behind… still he kept flying… on the last turn I shot him up good again at short range taking him up to 15 damage, causing a pilot wound, and started a fire! …. And that was the last we saw of Von Campbell! The best part about playing the game was it game me an excuse to wear my new silly hat! After Wings of War we played some Blitzkrieg Commander. We played my Tiger route Scenario again (Which I played with Gary last week). I changed it a bit; I didn’t give the Germans any reinforcements as Gary didn’t seem to need them at all. (I also forgot to give Kurt the Para’s AT platoon…). I set up pretty mush the same as Gary did. Curt set up some of his paras on the road, but others he brought on from the edge a bit further south. I had some trouble getting my teenage Grenadier trainees to do stuff for a couple turns near the beginning. I tried to get two platoons of them across the road but they were quickly pinned down there and taken out by a combination of small arms and mortar fire. He then proceeded to take out my MG platoon. I had a bit of an artillery duel with his mortar platoon and eventually cam out on top. His boys were hard chargers and make for Oosterbeek. Afterwards Curt was checking out some of my freshly painted Falklands figures and got a bit excited about getting in on the campaign… the madness is contagious! Completely Sidetracked! – Falklands Again! Okay, so I am officially completely sidetracked from my planned objective for this month of completing my Contemptible Little Armies/Back of Beyond Warlord Chinese Force. I thought painting up those couple stands would get the desire to something Falklands related out of my system… I think it’s only added fuel to the fire. I have a couple of Osprey books down off the shelf now, been flipping through them and other books I have kicking around on the subject. I’ve even been eyeing up Port Stanley , an old Wargamer magazine game I have. I’ve been holding onto Port Stanley forever as I’ve always had this silly notion of using a board wargame as a campaign system/scenario generator for a tabletop miniatures campaign. You can play the boardgame but use tabletop miniatures games to determine the outcome of battles (or at least the important and/or interesting ones..) when counters bump into each other on the map. 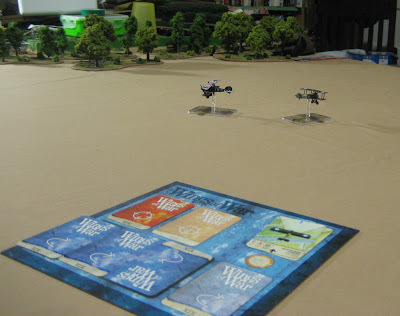 The boardgame combat resolution system can be used for unimportant/uninteresting battles and to keep the campaign moving along. Perhaps you could only play out the tabletop actions of particular units in the boardgame…? And use the boardgame for all other actions. Has anyone out there had any experience with this? Does it work? The problem with most is that the scale for a lot of board wargames is too grand; multiple divisions stack on single hexes. 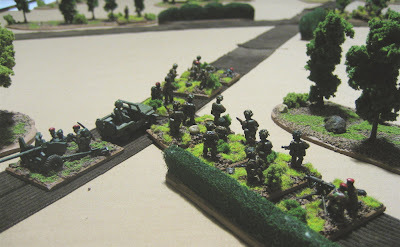 To play out the actions one would need a system where maneuver elements are brigades, perhaps, and stands are companies or battalions… to play out the tabletop games. That is a bit too big of a scale for a miniatures game, for me at least. A little too much would need to be abstracted. So, as I alluded to in a previous post, this is what attracts me to the Falklands conflict. In the grand scheme of warfare it was very small and on what I would imagine to be a manageable scale for a wargames campaign. In Port Stanley counters are companies and battalions – perfect for translation to tabletop action! (another boardgame I’ve been considering for use as a tabletop campaign system over the years is Operation Pegasus, the first wargame I ever bought! Again units are companies). So I’ve been kind of looking at what I might need for a Falklands campaign. I figure the most I’d need for any one battle would be about a brigade for each side: three to four battalions of three rifle companies plus a support company. Rifle companies would be made up of three platoon-sized stands, a battalion would therefore need 9 rifle/infantry stands plus mortar, MG, pioneer(? ), AT(? 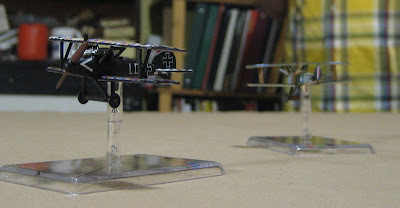 ), and command stands. If using 20mm I figured three figures per stand, four if 15mm. For infantry alone I would need 108 figures for 3 per stand, 144 if 4 per stand, for each side! This is just the basic infantry requirement (the “meat” of tabletop games). There woud of course also be some odds and sods on both sides (some of which I may represent on the table, some maybe not); artillery, armour, aircraft, ships, landing craft, etc, etc. I’d like an artillery piece for each side, AT, mortars and MG platoons – for pioneers I’ll just used brits with bergens… regular infantry for the Argentines and just mark them as pioneers somehow… the question is do what else do I need? The Panhard armoured cars? LVTP7s? For that AT platoon – were the brits using the Milan by then or some type of recoilless rifle (wombat?)? Did they even bother deploying AT platoons? How about the Argentines? I’m mostly just assuming they use the same orbat as the British here…? What’s actually available? Peter Pig? Smaller and slighter and not necessarily appropriate (and NOT CHEAP! )… but nice figures.. QRF? I picked up some QRF WW2 infantry a couple years back as samples… they were pretty damn chunky – so they might just fit right in! The first three sample stands; Paras in maroon, Guards in khaki, Marines in green. For comparison; combat miniatures 20mm figures on the left (of the picture), 15mm MJ figures on the right. Now here’s the stupid thing. 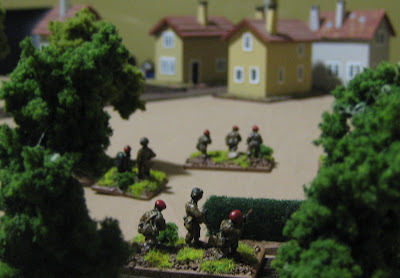 I have these 20mm Combat Miniatures Falklands figures and this is about it. I have a couple more command teams that I haven't painted, but otherwise what you see below is all I have. 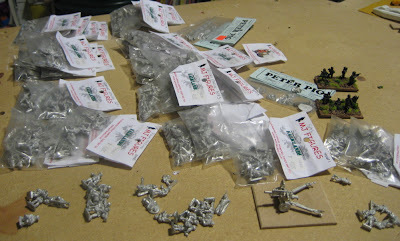 Obviously to play I’d have to buy a whole lot more… I do however have a PILE of 15mm Falklands miniatures from MJ figures. Because... well... having stuff in just one scale is never enough…. (especially a niche figures for a conflict like the falklands). 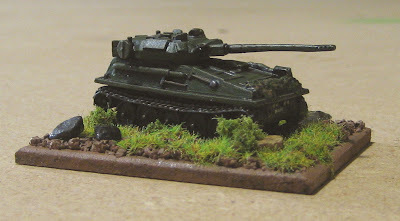 Anyway, I like the 20mm but I have piles of 15mm – I’m sure I have plenty enough for the British.. might need to pick up a few more Argentineans… so that’s probably the way I’ll end up going… although I'm not sure where will I find support weapon platoons in 15mm..? Mortars, etc? Maybe Peter Pig’s AK-47 stuff? I had thought, some years ago, that I’d like to do a campaign this year for the 25th anniversary – but that’s just not going to happen… maybe for the 30th.. Will anyone even remeber it then? Does anyone even remember it now...? 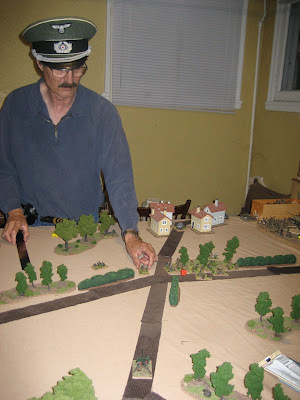 I played a second game of Blitzkrieg Commander on Friday, this time with a real, live opponent; Mr. Gary Chappell. 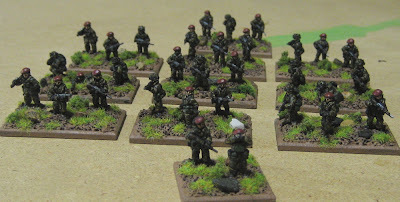 I spent a good chunk of my hobby time this week ragin ahead with Project Rebase and got a pile of 20mm Paras and Germans done – I even painted up a couple paras to finish up some stands. 20mm guys are kind of fun to paint… Quicker than 28’s, easier and less fiddly than 15s. The scenario I cooked up was called "Tiger Route". This was the path to be taken by L.Col Fitch's 3rd Parachute Battalion along the Utrecht-Arnhem highway. The battalion was to sweep into Arnhem from the north and link up with Frost's 2nd Battalion at the bridge. In his way, however was the 16th SS Grenadier Training and Reinforcement Battalion commander by Major Sepp Krafft (and later elements of the 9th SS Panzer Division!). We used relatively small forces for a quick game just to figure out the rules. Operation Market Garden, 17 September 1944. If the British player can exit 25% of his unit of the far end of the table by the end of the 12th turn he will score a minor victory. If he can exit 50% or his force by the end of the 12th turn he will score a major victory. 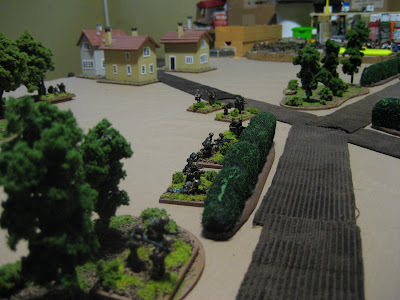 If the German player can cause 25% casualties he will score a minor victory, if he can prevent the British from exiting any forces off the table before the end of the game or cause the battalion to break he will score a major victory. I played the attacking Paras (no surprise there…) and Gary played Major Sepp and elements of his Grenadier Training and Replacement Battalion (other elements were busy engaging the 1st Parachute Battalion to the North). Initial Dispositions: This picture is taken from the North. At the west end of the table (right) you can see the 3rd Para Battalion marching in column up the Utrecht Arnhem highway. In about the center of the table are Gary’s units. Off to the East (left) is Oosterbeek, my exit point. That’s Gary in my silly German hat. 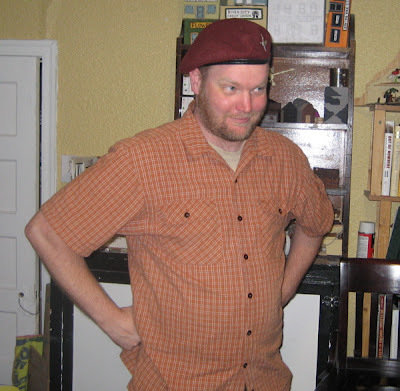 That’s some goof wearing my Para beret… oh wait… that’s me…?! Off to a bad start; I roll a 10 for orders. My troops just hang out on the road – accepting apples and other refreshments from the jubilant Dutch. Gary’s doing no better as he rolls a 12 triggering a Command Blunder – “CEASE FIRING!” – Some anxious 16 year old German hiding in the woods thinks he sees Some British paras lurking in the hedgerows just down the line and starts firing… his equally youthful and inexperienced comrades join him… (Krafft’s HQ takes three attacks from firing – luckily he is neither killed nor suppressed). Crappy as that may have been for Gary he has nowhere he needs to be by any particular time, I have 12 turns to get these hardened killers into Oosterbeek and on their way to the bridge at Arnhem and I just lost one turn! The far off chatter of small arms fire (krafft getting shot at by his own me..!?) reminds the lads that there is actually a war on and they’ve places they need to be. I successfully issue one set of orders, which gets the column a whopping 10cm up that wretched corduroyed road. Krafft, on the other hand, had to teach some of his recruits how to reload their weapons (after firing off all their initial magazines – at HIM!!!) and was thus unable to issue any orders this turn. The Paras start to feel a bit of a sense of urgency (perhaps they can hear the far off shooting as 1st battalion runs into the norther part of the line Krafft is holding – or maybe the tank guns firing at Major Freddy Gough’s Reconnaissance Jeep squadron as they blunder into elements of the 9th SS Panzer “Hohenstaufen” Division!). I issue three consecutive, succesfull move orders to the entire battalion! WHOOSH! They go storming up the road. In the shock and confusion of the initial ambush LCol Fitch has a brain-fart – rolled an 11 for my first attempt to issue orders. Everyone stays on the road. Gary ‘s guys take full advantage of this hesitation and again carry out three successful fire orders; the first took out my mortar platoon, the second scored 5 hits and a suppression on a Para platoon, and the third finished it off. Five down, one short of my break point…. The German’s firing takes out the jeeps towing the 6 pdrs. His second attempt to issue orders comes up box-cars – “OPEN FIRE!” suppresses one of my units – at least he’s done… Unfortunately I’m at my break point. Fitch is finally getting things together. First he gets the AT platoon deployed and the rest of the paras a little further off the road. 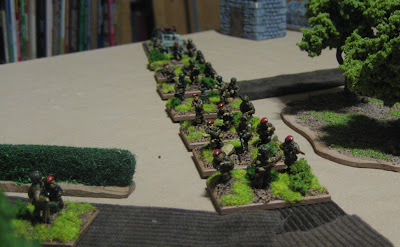 The gets two more orders out moving the paras across the open ground south of the Utrecht-Arnhem highway while the 6 pdrs of the AT platoon cover their advance – first suppressing the German MG platoon, then causing it for fall back! Yay! Things are looking up! Krafft holds a moment of silence for the hundreds of dead paras they slaughtered before them on the road – no orders issued. Again Fitch got his 6 pounders firing and covering the advance. First a hit, then two more and a suppression before those hardened killers of the 3rd parachute Battalion charged into the woods assaulting the two platoons blocking their way to Oosterbeek. Unfortunately Gary shot up one of my platoons as they charged in, suppressing them. In close combat this platoon was finished off and the platoon that had been supporting in was forced to retire. The Germans disengaged and fell back further into the woods. The other German platoon, which had been suppressed by the 6 pdrs was over run and the paras engaged in this action took up positions in the north end of the small wood to cover the flank for the remainder of the battalion as it tried to press on into the woods over the next couple turns. Positions at the end of my turn. Gary gets reinforcements this turn - a reconnaissance platoon of Sdkfz222 armoured cars from the 9th SS Panzer Division rolls up and offers their assistance to Krafft. Gary moves some guys around and fires on my units causing some hits and suppressions. The Paras don’t break (I’m now making break checks at -1…). The remains of the battalion tries to move up into the woods. 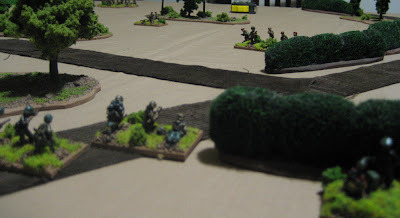 More Recce troops arrive to reinforce the Germans, this time a platoon of PanzerIILs. Gary does some fancy maneuvering and firing causing 2 hits and a suppression one my flank protection platoon and brought one unit into close combat with them. The MG moves and the mortar fires causing another hit and suppression and another unit moves up to support the close combat.. They do the same thing another time and cause two more hits..! The Gary’s luck runs out and he rolls a twelve again… the third time this game so far!? This is the worst; “CROSSFIRE” – Three units nearest the command take 3 attacks from firing. Guess those young Germans got a little too excited and started firing at just anything that moved… including some of their own guys. The result of all this indiscriminate firing is that the unit in close combat with my para platoon at the north end of the woods takes two hits and is suppressed; the supporting unit also takes a hit, but is not suppressed. The MG platoon (which was probably the instigator of all this “friendly fire” incident) took fire back from their angry comrades and was, itself, suppressed with two hits. This totally saved me from immanent destruction! In the close combat the Germans were forced to retire and my guys held on. Gary doing some of that fancy maneuvering. Snake-eyes for the Break Test – think this should give me some benefit.. maybe no more break tests for the rest of the game or something… Box-cars for my orders – nothing of interest takes place this turn. The two platoons that could have done initiative fire were suppressed – they recover, that’s about it. Gary gets more reinforcements – the Jagdpanther! He doesn’t know what to do with it so leaves it off the table. The Germans then suppress some of my guys with some initiative fire but do little else of interest this turn. The Paras hold on! 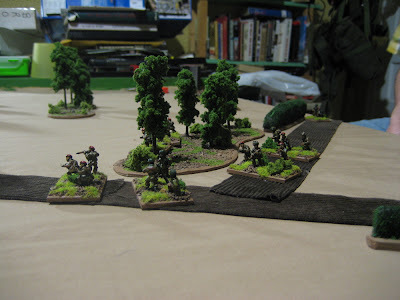 Initiative fire suppresses one German unit and I finally got all my guys moved into the damn woods. That’s about it. Gary blazes away for two consecutive order phases and knocks out another platoon of Paras. The boys hold on! Finally cleared and consolidated the woods but can’t press on as we are totally surrounded… and that’s it for the game. Gary plays out his last turn but fails to knock out anything else. 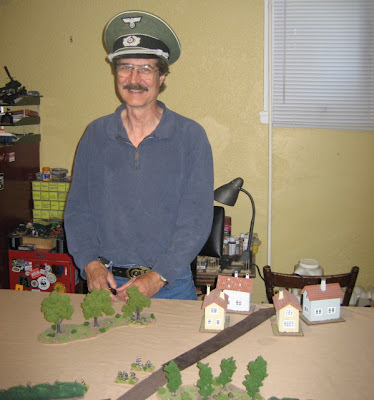 A major Victory for SS Major Sepp Krafft (Gary)! He wiped out 6 platoons of paras along with their mortar platoon and the jeeps that towed the AT platoon to a loss of only two of his own platoons! A fun game I was pretty much done for after Gary’s extremely successful ambush of my column on the Utrecht-Arnhem road. There was a lot of give and take though. I really like the command and control system – I think it accurately reflects the chaos of command and how communication can totally break down. Gary and I are keen to try it again. We may even try the same scenario again later this week but switch sides…. In the meantime I will continue with Project Rebase so we can potentially try a bigger game with more than one HQ/Command unit per side. You’d think I just didn’t want to get started on painting my Chinese…. As mentioned in the previous post about distractions I have decided to re-based all my WW2 figures (15mm AND 20mm). Not to conform, necessarily, to any particular set of rules’ basing guidelines, but for purely aesthetic reasons. 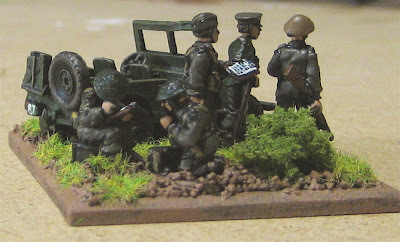 Instead of doing something reasonable like waiting until I actually thought I might get around to playing a lot of WW2 games I decided to launch right into the rebasing project this week – and while I was at it I painted a few new 15mm figures as well. So I started with rebasing some non-WW2 figures just to see how they look like. 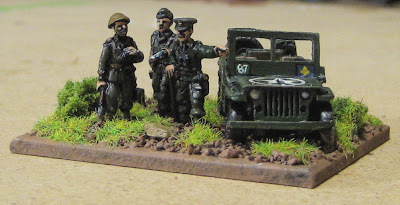 These are 15mm SAS from MJ Figures Falkland Islands War line. … and then I did a platoon of DAK. On the left are a couple stands with the new basing system. Not much opportunity for adding fancy terrain or making it into a mini diorama in the desert… but at least they look a tad less crowded. 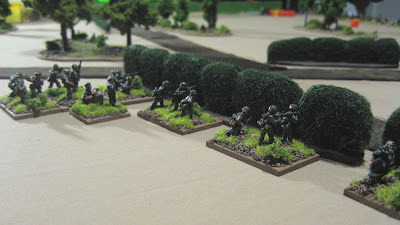 … and finally I painted up a command team, PIAT team, and a 2” mortar team from a Battlefront British Airlanding Platoon. Now I officially have British (or CANADIAN!) Paras in three scales (15mm, 20mm, and 28mm) – what is wrong with my head!? Well John didn’t come over just to have pictures taken of his pretty Toy Soldiers (see previous post). We also tried a very small quick game of Bob Barnettson’s Two for Tea rules – which I had played at Mayday in Edmonton. We, however, played it with much bigger figures! Most of the figures I used are some of the same figures from the aforementioned (see previous post), which were modeled, molded and cast by John himself (with a few Rafm figures thrown in here and there and the officers were from Old Glory ). I painted them up ages ago and just this past week rebased them on the stands you can see in the pictures below. I currently have a pretty limited selection of troops; four French battalions and two English. So I set up a scenario where the English had set up a hasty defense of some town when they discovered a column of French were heading up the road. The French, too, were surprised by the presence of the English and marched onto the field in column. There were three victory locations; a crossroads, a log cabin and the town. Whoever controlled a majority of these at the end of 12 turns would win. The British could set up in any formation, anywhere on their half of the table. The French all had to set up in column and either the back edge of the last base in the column had to start at the edge of the table or columns could be up to 30cm/12” onto the table if they were on a road. 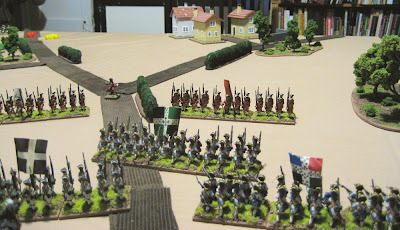 John decided to play the British and set up his defenders in line in front of the crossroads. I set up my French pretty much opposite him and we went at it! For my first command/orders roll I threw an 11. End of turn one. Not a good start, as there was that silly time limit thing. Things got moving on turn two. 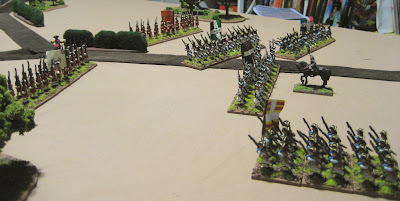 As I approached his musketry savaged two of my battalions but in the end strength of number carried the day and the British force broke and ran on or about turn 8. It was a pyrrhic victory at best as two of my battalions had been reduced to a single stand and the other two had also lost one, though none of my battalions were completely wiped out. Same thing. Bird's eye view. Same thing. Bird's eye view from the British side of the table. Yep, you guessed it; Same thing. in this one you can clearly make out the crossroads (where the British colonel is standing) and the village in the background. The log cabin would have been off to the left. Next week Gary and I will be trying out Blitzkrieg Commander again. 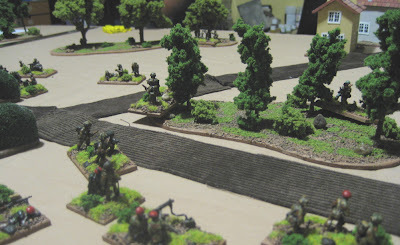 Here are some pictures I took of my friend John Bertolini's toy soldiers. These are home cast from Prince August molds from Holger Eriksson masters. The uniforms are (left to right); Swedish, Royal Suedois in French service, French, Danish, Swedish, and Russian. These are samples of battalions already painted or to be painted (16 figures per battalion). These are also home cast from Prince August molds from Holger Eriksson masters. The uniforms are (left to right); Swedish Cavlary, Swedish grenadier, Austrian grenadier, Danish grenadier, "Wild Geese" (Irish in French service), and a Dragoon of an imaginary regiment yet to be named (Society of Daisy members take note!). Danish Grenadier Korps. These 25mm figures modeled, molded, cast, and painted by John. Same thing with Charles Grant inspired house. 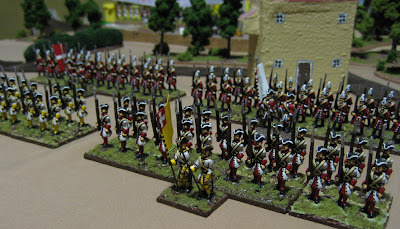 Danish Prince George Regiment - Line Infantry. Again, 25mm figures modeled, molded, cast, and painted by John. Danish Life Guard. Same figures as above, different colours! 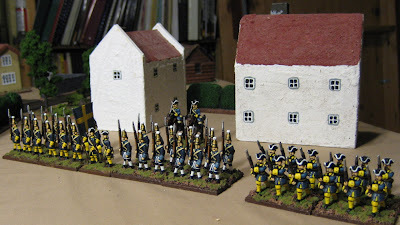 A smattering of Swedes; Grenadiers, Line Infantry and a couple of Cavalry (25mm figures modeled, molded, cast, and painted by John). If you have any comments for John please feel free to post them here.